And just like that October is over and we are on to November, and with that Canadian Nationals is done and dusted for another year. After finishing off a busy start to the season, I came home to Victoria after Providence KMC Fest for the largest Cross on the Rock (COTR) race to date! Topaz Park in Victoria also proved to be the muddiest race of the season so far and with over 350 people in all categories, it was an amazing day. I opted to race with the expert men again this day, and had a great battle with the fast dudes, sometimes just battling to stay upright in the slick corners and off camber run up. Huge thank you from all racers to local WD40-Bike rep Pete Creighton for spending the entire day attached to the power washer cleaning bikes. The long Horst Spikes in my Giro Empires was the ticket to staying upright here! With a weekend off in between Topaz Park and Nanaimo, I set about trying to recover and get fast legs. 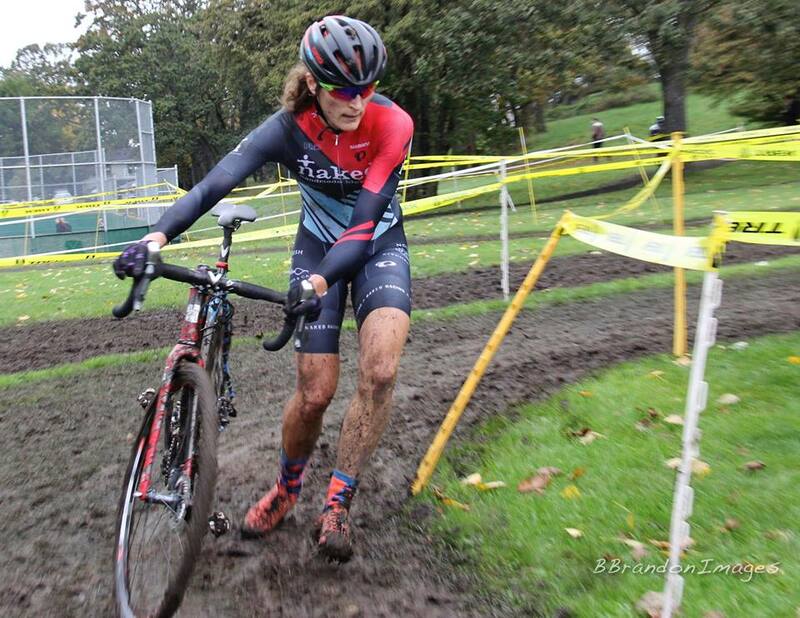 Flying to Winnipeg for Canadian Nationals, I was dreaming of mud and rain, which we totally got for the Friday pre-ride. The wet clay was so sketchy and fun to ride on, and this course is so much fun that you could just ride in circles for hours. 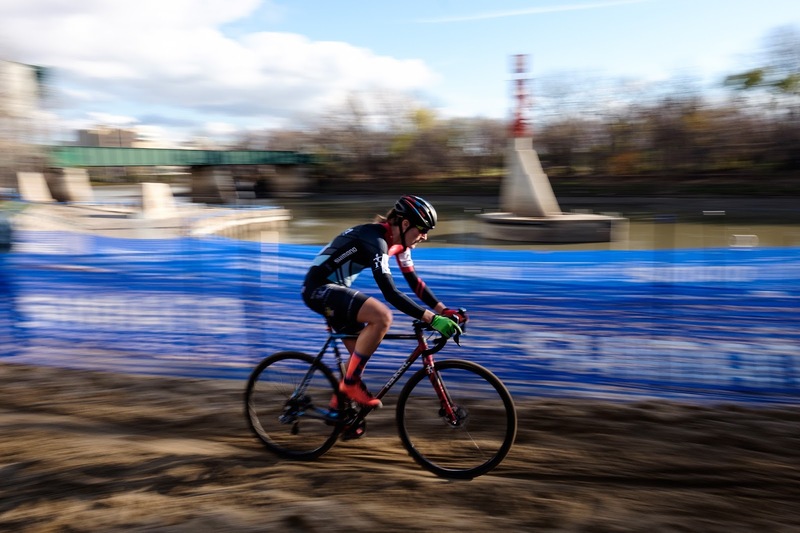 The rain stopped Friday evening and although the morning races were a muddy mess, the course dried out significantly for our afternoon start with just a few really slick corners to keep you on your toes. I had felt really good pre-riding on Friday, but I like to be cautiously optimistic about how I feel going into a race. Maghalie Rochette of Luna (was the wheel to watch) got the early holeshot, and after slipping my pedal off the start, I worked hard to get to her. Through the first half of the course I stayed on her like glue, but it’s interesting when you are feeling good, sometimes things feel a little easy. Just past the pits for the first time I decided to push the pace up a little, try to spread out the field a little. Passing Maghalie I accelerated out of a technical corner, looked over my shoulder and realized I had a couple bike lengths gap. Decision time here, do you keep pushing on hoping to open the gap, or settle back in and save energy for later in the race. Given the chance, I will almost always choose to push the pace till I blow up…maybe not always the smartest J. I stayed on the gas and slowly opened up my lead, through the 3 long sand pits and the steep run up I was able to open up my lead considerably so never looked back. 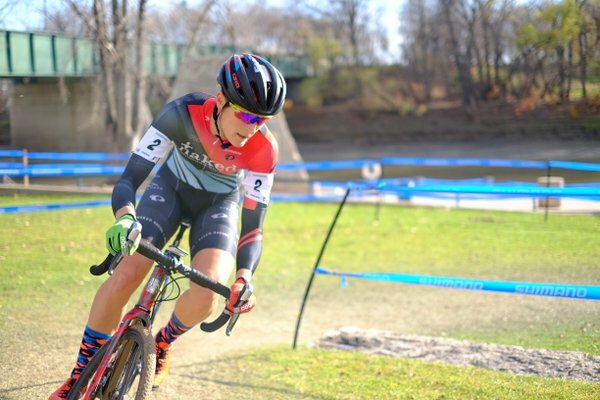 Bike, tires, body, everything felt great on the day, worked perfect, and I had a solid day on a fun course, winning the Canadian National Champion jersey back after a 2 year hiatus on the back of a mountain bike World Champion. Huge shout out to the Shimano guys for sun tanning with my bike in the pit, thank you for standing there in case I needed you, but totally glad I didn’t need you! 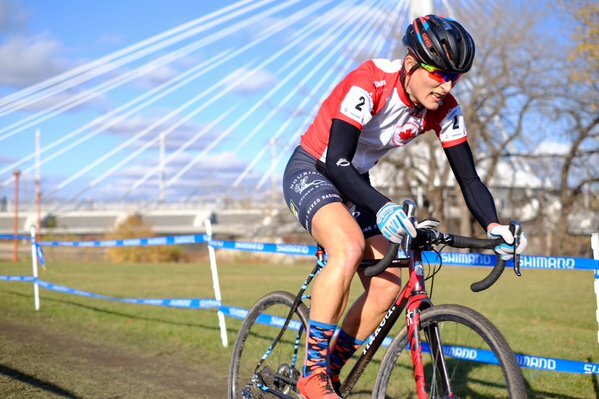 The organizers of Winnipeg CX 2015 did a great job enticing a lot of fast racers from south of the border to come up and race the fun “Wannabe Canadian Race” on Saturday, and then the C2 on Sunday. Day 2 was on the same course under almost the exact same conditions, corners just slippery enough to keep you on your toes but fast and fun. Out of the gate, Red Truck’s Natasha Elliot was on a mission and took the holeshot, but with an early bad cornering decision I passed her and put some time into the field through the off camber corners. Again, faced with the decision to push or race “smart”, I pushed the pace and opened up a lead. Meredith Miller was close on my heals but I seemed to have just enough pop in my legs left to keep her at about 10 seconds. Near the end of lap 3 Maghalie, who had some anger watts from the day before, caught up to me and together we were able to extend the gap to Meredith to about 30 seconds. In lap 4 making a technical error I lost contact with Mags and that was all she needed to attack and pull away. 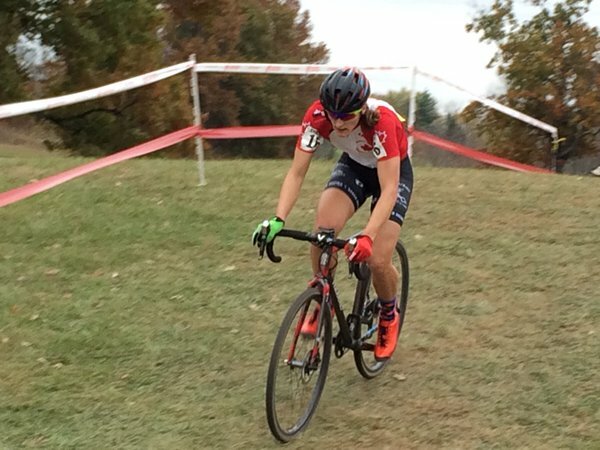 I managed to keep Meredith off my wheel and finished 2nd on the day. Stayed a couple days in Winnipeg to catch a Jets game and ride with the volunteer shuttle driver for the event, then headed east to the Cincy CX. I had never done this race and was really excited to ride here. Day one at Kings Parks was a flat out dirt crit with a “big” hill in the middle called the Camel. Rain the day before made the ground soft and watt suckingly spongy, but oddly not muddy. Corners were fast with tonnes of traction, and this turned out to be a really tactical race. The start was fast, with some wide sweeping corners and quickly hitting the first hill in the Camel. I found myself in really good company, sitting in top 10. Slowly, as KFC slowly opened up the pace (good to see her back to old fastness), the field was strung out a little more in each corner. Sitting 4th wheel in the chase group the pace was really high, and with little technical to break up the course this was a flat out power and fitness course. I felt great, but the pace really started to get to me, 3rd lap I lost contact with the chase group through the long deep sand pit and found myself in no mans land for half a lap. I didn’t have the legs to stay with the power in the second chase group, but managed to hold on to 11th place. 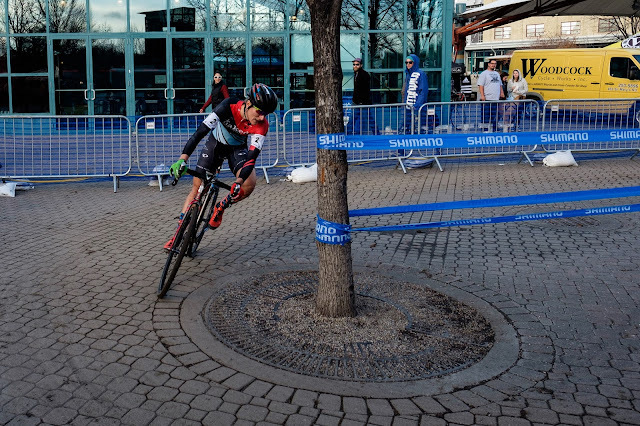 Thank you again for your continued support and making my season happen J Last local racing for me this weekend, Tacoma UCI race next weekend and then the much anticipated SingleSpeed Cyclocross Worlds right here in Victoria! Time to rebuild the engine after that and tickets are booked to head over to Europe in December! !